Double X Science: Is the bar high enough for screening breast ultrasounds for breast cancer? Is the bar high enough for screening breast ultrasounds for breast cancer? a small cyst. Source: Wikimedia Commons. 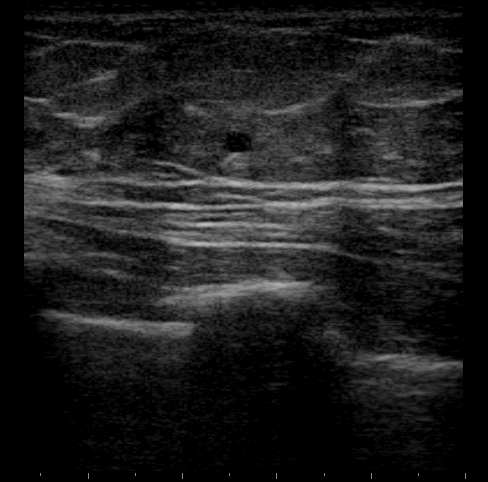 In a unanimous decision, FDA has approved the first breast ultrasound imaging system for dense breast tissue “for use in combination with a standard mammography in women with dense breast tissue who have a negative mammogram and no symptoms of breast cancer.” Patients should not interpret FDA’s approval of the somo-v Automated Breast Ultrasound System as an endorsement of the device as necessarily beneficial for this indication and this will be a thorny concept for many patients to appreciate. If the approval did not take place in the setting of intense pressure to both inform women that they have dense breasts and lobbying to roll out all sorts of imaging studies quickly, no matter how well they have been studied, it would not be worth posting. Dense breasts are worrisome to women, especially young women (in their 40s particularly) because they have proved a risk factor for developing breast cancer. Doing ultrasound on every woman with dense breasts, though, who has no symptoms, and a normal mammogram potentially encompasses as many as 40% of women undergoing screening mammography who also have dense breasts, according to the FDA’s press release. Dense breast tissue is most common in young women, specifically women in their forties, and breast density declines with age. The limitations of mammography in seeing through dense breast tissue have been well known for decades and the search has been on for better imaging studies. Government appointed panels have reviewed the issue and mammography for women in their forties has been controversial. What’s new is the “Are You Dense?” patient movement and legislation to inform women that they have dense breasts. The approval of breast ultrasound hinges on a study of 200 women with dense breast evaluated retrospectively at 13 sites across the United States with mammography and ultrasound. The study showed a statistically significant increase in breast cancer detection when ultrasound was used with mammography. Approval of a device of this nature (noninvasive, already approved in general, but not for this indication) does not require the company to demonstrate that use of the device reduces morbidity or mortality, or that health benefits outweigh risks. That’s clearly an important point, but not one that patients in the US understand. Patients hear “FDA approval” and assume that means a technology most certainly is for them and a necessary add-on. This disconnect in the FDA medical device approval process and in what patients think it means warrants an overhaul or at the minimum, a clarification for the public. Is cancer detection a sufficient goal? In the FDA study, more cancers were identified with ultrasound. However, one has to question whether breast cancer detection alone is meaningful in driving use of a technology. In the past year, prostate cancer detection through PSA screening has been attacked because several studies and epidemiologists have found that screening is a poor predictor of who will die from prostate cancer or be bothered by it during their lifetime. We seem to be picking up findings that don’t lead to much to worry about, according to some researchers. Could new imaging studies for breast cancer suffer the same limitation? It is possible. Another question is whether or not the detected cancers on ultrasound in the FDA study would have been identified shortly thereafter on a routine mammogram. It’s a question that is unclear from the FDA submission, according to Amir. Meanwhile, numerous imaging modalities have been proposed as an adjunct to mammography and as potential replacements for mammography. In 2002, proponents of positron emission tomography (PET) asked Medicare to approve pet scans for imaging dense breast tissue, especially in Asian women. The Medicare Coverage Advisory Commission heard testimony, but in the end, Medicare did not approve it for the dense-breast indication. PET scans are far less popular today, while magnetic resonance imaging (AKA MR, MRI) and imaging have emerged as as adjuncts to mammography for women with certain risk factors. Like ultrasound, the outcomes data is not in the bag for screening with it. In an interview with Monica Morrow, MD, Chief of Breast Surgery at Memorial Sloan-Kettering Cancer Center, New York, several months ago concerning the rise in legislation to inform women about dense breasts, which frequently leads to additional imaging studies, she said: “There is no good data that women with dense breasts benefit from additional MR screening." She is not the only investigator to question potentially deleterious use of MR ahead of data collection and analysis. Many breast researchers have expressed fear that women will opt for double mastectomies, based on MR, that in the end, may have been absolutely unnecessary. "There is one clear indication for MR screening," stressed Morrow, explaining that women with BRCA mutations should be screened with MRI. "Outside of that group, there was no evidence that screening women with MR was beneficial." At just about every breast cancer meeting in the past two years, the benefits and harms of MR and other proposed screening modalities come up, and there is no consensus in the field. It should be noted, though, that plenty of breast physicians are skeptical about broad use of MR– not just generalists outside of the field. In other words, it is not breast and radiology specialists versus the US Preventive Services Task Force - a very important message for patients to understand. One thing is clear: as these new technologies gain FDA approval, it will be a windfall for industry. If industry is successful and doctors are biased to promoting these tests, many may offer them on the estimated 40% of women with dense breasts who undergo routine mammograms, as well as other women evaluated as having a high lifetime risk. The tests will be offered in a setting of unclear value and uncertain harms. Even though FDA has not approved breast MRI for screening dense breasts, breast MR is being used off label and it is far more costly than mammography. When patients raise concerns about the unaffordability of medical care, they should be counseled about the uncertain benefit and potential harms of such a test. That may be a tall bill for most Americans to consider: it’s clear that the more is better philosophy is alive and well. Early detection of something, anything, even something dormant, going nowhere, is preferable to skipping a test, and risking who-knows-what, and that is something, most of us cannot imagine at the outset. Ed note: The original version of this post contains a posted correction that is incorporated into the version you've read here. The opinions in this article do not necessarily conflict with or reflect those of the DXS editorial team.